Creamy cauliflower sauce, I mean. How long has it been now? Years? I first posted the recipe for that garlicky, creamy, healthier Alfredo type sauce in 2012, and then in 2013 I wrote a whole bunch of other recipes including a whole ecookbook with recipes using the cauliflower sauce because you and I both Could. Not. Stop. and now here it is again! Making it’s grand entrance back into my life in the most delicious pan-roasted mushroom way. Speaking of pan-roasted mushrooms, uhmm, those little shnugins are good. When you melt a little butter in that pan and get it really nice and sizzling hot, just before browning, and then you toss in those fresh, clean, pale mushrooms and watch them soak and sizzle and slowly turn the perfect shade of roasty golden brown right before your very eyes… that’s when you know the truth about mushrooms. I’m not even going to talk about adding garlic, white wine, or any of that because I will fall right off the edge. 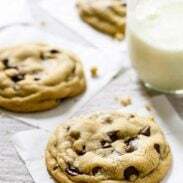 If I had an oven, I wou– just kidding. I won’t start that whole thing again. But since I actually don’t have an oven and won’t have an oven until five days from now *eeeeee* I made this at HOME home, like my parent’s house, and my 12 year old brother came in and saw it being all put together and started snatching mushrooms right out of the pan. What in the? LITTLE BOY KNOWS. You guys, I have to talk to you about something and it’s a podcast called Serial. It was recommended to me by a number of people and I’ve recently been diving head-first into the series with complete and utter reckless abandon. It’s like that with TV and me – binge-watching through a season is how I most enjoy my entertainment. So now that Serial has me wrapped around its finger, I’ve been plowing through those episodes like it’s my job. Sometimes I pull into my parents’ driveway, an hour drive from our house, and I have no recollection whatsoever of actually driving myself there. But I can, more importantly, recall every detail about Asia McLean’s letters and what truly happened in the library on January 13th, 1999. Oh, no. I’m that girl. If you podcast, you must start Serial. I take no responsibility for your missed meetings, appointments, and general distraction of life. Also, if you mushroom, which I know you do because we just go together that way, you must try this deep, cheesy pan of cozy winterish comfort food. This beauty is going to combine pan-roasted mushrooms with whole wheat pasta with the really defined ridges (mmm texture!) and creamy cauliflower sauce tossed up together, and then baked under a blanket of Gruyere cheese and decorated with fresh sage ribbons. How good is sage, by the way? Oh my gosh IT’S GOOD. Those pretty, fragrant, clean-and-cozy smelling velvety leaves are my Fall 2014 food muse. 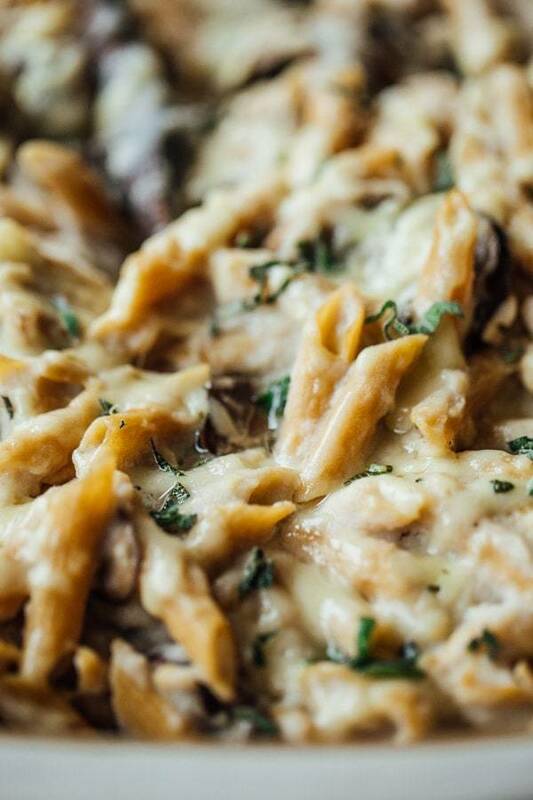 Healthy Mushroom Alfredo Pasta Bake with pan-roasted mushrooms, whole wheat penne pasta, creamy cauliflower sauce, and Gruyere cheese. Bring a large pot of water to boil. Cook the pasta for 5 minutes – it should still be a little firm. Drain, toss with a drizzle of oil, and set aside. Bring a large pot of water to a boil, add the cauliflower, and cook for 5 minutes until tender-crisp. Meanwhile saute the minced garlic with a tablespoon of butter. Using a slotted spoon, transfer the cooked cauliflower to a blender with 2 cups broth, milk, oil, salt, and sauteed garlic. Puree until very smooth. You might need to do this in batches. Preheat the oven to 400 degrees. Heat the 3 tablespoons butter in a very large skillet. Add the mushrooms and saute until golden brown. Toss the cooked pasta, cauliflower sauce, and mushrooms together. Add the remaining cup of broth to help the consistency stay saucy. If you have time and want some extra flavor, add some caramelized onions, bacon, or sausage to the pasta before mixing and baking. YUM! Not usually a fan of mushrooms (unless they’re in burgers) but this dish looks rather extraordinary!!! 🙂 Is there any particular type of mushroom you recommend which goes best with the rest of the recipe? Oh wow – this does look amazing! Who knew alfredo could be healthy? Thanks Kristen! Love me some healthy cauliflower alfredo sauce! I finally made your creamy cauliflower sauce, but I roasted the garlic instead of sautéing it. It was oh so good! I want to put it on everything. Roasted garlic! You are my BFF. I just made this (and am eating it right this very moment!). I did not add the additional cup of stock, as everything seemed quite liquid-y enough, and it turned out with a great consistency. I think if I’d added it, it would have been soupy. The only other change I made was adding about 1 1/2 tsp of Herbes de Provence to the mushrooms near the end of their sauteeing. Yum! Great recipe, thank you! I love hearing that! Thanks for the comment Jenn! OMG this looks absolutely amazing. Cauliflower sauce – so smart! Can’t wait to try this. Mmm rotisserie chicken! Great idea! This looks so decadent! I love that it’s actually healthy! Well, you know, healthy is a bit subjective… but lots of veggies in here! 🙂 So that’s a good start right? I am all about pasta bakes right now! This needs to happen soon! That looks delicious and so easy to do, I’m gonna have to give it a go this week. Plus it’s an excuse to use up all the pasta I have lying around! Any excuse for pasta, right? This looks so great! I am totally making this for a big Sunday meal tonight! Obsessed with Serial and obsessed with this recipe! We made this tonight and it was amazing! We added Italian turkey sausage and onions. I can’t wait to eat the leftovers for lunch! I also can’t wait to hear next weeks episode about Jay….I have always thought he was shady and something didn’t seem right with his story! My toes are tinging that you added sausage and onions. YUM. And my fingers are tingling about Jay. Seriously something is off there. We listened while laying in bed last night… new personal low? Yikes. Looks great! Reminds me I need to make another batch of your cauliflower sauce soon. Yum yum … I’m in love with gruyere cheese at the moment, so this is calling my name. I love that it’s all oozy and cheesy bbuuut … not unhealthy because it’s full of cauliflower! I love how you’ve found so many great ways to use your cauliflower sauce, what a winner! This looks so hearty and comforting, it’s totally going on my dinner menu list. Probably will be made very soon as it’s starting to snow today. SNOW! yesssss. It’s like an excuse to eat all the good food. Cauliflower sauce and mushrooms going great, and what looks good in the picture, barely wait to cook tomorrow, so do not really know what to eat. Thanks for a brilliant idea. We love pasta dishes equally like Indian ..This sauce really is something new ..I love to put wholewheat pasta instead of regular one ..Will get back to you soon, how we liked it . Awesome! I hope you like it Sathya! I really wanted to love it, but this dish just didn’t do it for me or my husband. It tasted bland – even after adding some of the tasty add in’s like caramelized onions and bacon. The way this recipe is written out makes it extremely difficult. What is with step #3? Its like five steps. Made me mess up the sage. A little clarity in your writing will improve our experience. Thanks for your feedback Jessica. I pinned your recipe the other day and came back for the ingredients and instructions today. Only the website it took me to seemed “off”. So I Google searched the recipe and wound up here. 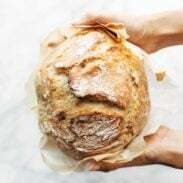 Your recipe and a photo have been posted on this other site. I just wanted to let you know. I kept the info to the site. I didn’t want to post it here and give them any more exposure but if you decide it’s something you’d like to pursue I’ll be glad to pass on the link to you. I know this is a never ending story! In other, more positive news, this is amazing and I cannot wait to make it! Thank you Jamie! We have this happen all the time. BOOOO! Where are the internet police? 🙂 I’ll email you. Thank you so much Sarah! Glad to hear that you like it! This looks totally delicious… Am hoping it’ll help me get some mushrooms into my pasta-obsessed-veggie-sceptic two-year-old. Would you cook the sausage/bacon before baking? I served this up for my daughter-in-law’s birthday before the Thanksgiving week. It was fabulous and we snacked on it for days. None was left after three adults and two kids dug in. I used quinoa pasta and did add a lot of bacon. I also sauteed a variety of mushrooms – mostly portabello – and seasoned them with some spicy meat rubs we have. It is definitely a keeper! I love it when I am (you help me be) a Food Hero!